For the 1992 season, Giuseppe Lucchini managed to secure an engine deal with Ferrari for his BMS Scuderia Italia Formula 1 team. 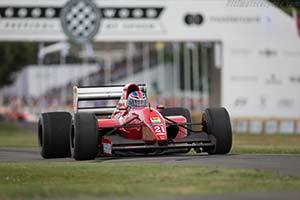 The deal entailed the supply of the 1991 specification Ferrari Type 037 V12 engine, which was still deemed to be superior to the Judd V10 used by BMS during the 1991 season. The team took over the role as Ferrari customer from rivals Minardi, who had switched to Lamborghini V12s for 1992. Producing around 700 bhp, the 3.5-litre V12 engine was bolted to an evolution of the Dallara F191 chassis used during the previous season. Designed by company founder Gian Paolo Dallara and Nigel Couperthwaite, the new F192 was a conventional Grand Prix car. It featured a carbon-fibre monocoque with push-rod suspension on all four corners. Much of the work over the winter focused on adapting the existing design to accommodate the Ferrari engine. Whereas Ferrari used the groundbreaking paddle-operated sequential gearbox, the F192 was equipped an evolution of the H-pattern, six-speed gearbox used in 1991. The gearbox combined a Dallara designed and built casing with Hewland internals. Liveried in Italian racing red with prominent Marlboro sponsoring and producing the same glorious howl, the BMS Dallara F192 could at first glimpse easily be mistaken for one of the Ferrari works cars. Tasked to drive for the team in 1992 were JJ Lehto and Pierluigi Martini. Despite the boost in power, they struggled throughout the year and Lehto even failed to qualify once. Martini did manage two sixth-place finishes. Scoring just two points, BMS Scuderia Italia slipped from eighth in 1991 to tenth in the 1992 Constructors' Championship. While the team retained the Ferrari engines in 1993, it switched to a Lola chassis for what would turn out to be the team's final year in Formula 1.